With end of support for legacy HP Toolset including QC, QTP and Load Runner, businesses running critical applications on these are increasingly upgrading to achieve greater compatibility with HP Toolsets. An optimized asset management and cross project asset sharing is also possible with QC/ALM and this drives the decision of upgradation/migration. Upgrading to ALM helps organizations which are moving from conventional development approach to a fast paced Agile Environment, to manage their application quality in a better way (with tools like Agile Manager and HP Sprinter those integrate into ALM). 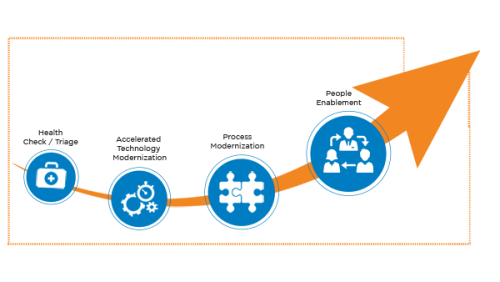 Cigniti follows a 9-step migration process to let you realize the true potential of HP ALM software. 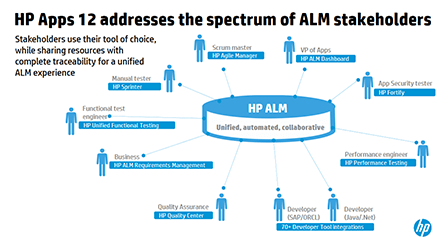 While HP QC Enterprise helps bring in consistency in QA procedures across the application lifecycle, HP Application LifeCycle Management (ALM) does that and more by providing the visibility and collaboration you need to bring agility to your enterprise. Cigniti helps organizations address a unique set of challenges around deciding when to move data from older HP Quality Center software systems to the New HP ALM and start realizing the benefits of making that move. Cigniti professionals have expertise and experience to most effectively handle this migration and help you get the greatest value from HP QC to ALM migration. Cigniti has a strategic partnership with HP that allows us to offer additional value to clients across verticals. HP Service Provider Partner: Being selected as one of the reputed service provider partners for HP, Cigniti has access to HP tools and training to successfully deliver HP Software & Solutions implementation services to clients. HP Enterprise Level Agreement: Enterprise License Agreement (ELA) with HP provides us an ability to utilize HP UFT/QTP/LR/QC/ALM licenses on pay‐per‐use/term basis. There are many ways to upgrade QC to HP ALM and each approach comes with its own challenges and an efficient approach is needed to reduce the effort. Businesses choose one of the two upgrade path options available to them – Direct Upgrade & Phased upgrade, based on the number of projects, infrastructure, downtimes and priority. A Direct Upgrade works well with companies which have lesser number of projects and when there are no changes to schema or underlying infrastructure. This path has a higher server downtime. A Phased Upgrade, on the other hand, works with bigger enterprises where there is a need for sandbox infrastructure to have the legacy instance running which projects are ported and made live on the new instance. Cigniti believes in continuous innovation and helps organizations adopt latest tools using its Migration Accelerators. Below is the partial list of Clients who have used Cigniti’s Migration accelerators. HP ALM gives IT teams a common workspace in which to train, implement, and track their project activities and contains a number of new features that bring testing and full application lifecycle management together. Centralized Process Standardization to create templates & enforce workflows/process across multiple projects. 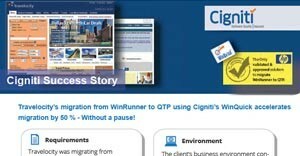 Travelocity’s migration from WinRunner to QTP using Gallop’s WinQuick accelerates migration by 50 % – Without a pause! Gartner predicts that by 2020, the shift to the cloud will have affected business decisions worth about a trillion dollars.